A bridge between Sicily and the Mediterreanean Area: BioHyst cutting edge solutions for a more efficient use of agricultural resources. 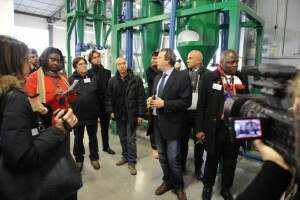 February 13, at the BioHyst Research Center in Switzerland, a scientific-technical demonstration of the Hyst system (Hypercritical Separation Technology) completed the dialogue which began in Calatabiano (CT) with entrepreneurs in the agriculture and bio-energy sectors, scientific bodies and Sicilian institutions. In Sicily’s economic scenario, a reflection of Italy’s national economy, agriculture can become the heart of a sustainable and ethical bioeconomy which supplies food and feed, energy and other green chemistry products. In this scenario Hyst can act as a key element in the creation of integrated bio-refineries in the territory. In fact, from one single biomass, even a low quality one, Hyst produces high quality products suitable for different sectors. Proof of this were the results of on site analysis carried out on the products after processing straw and bran with the Hyst system during the Swiss demonstration. In particular, tests on straw showed an increase of more than 100% of protein content in the more “noble” fractions, and a doubled production capacity in biomethane. Straw pretreated with Hyst, therefore, has a higher performance than corn silage, the reference energy crop. The possibility to use agricultural residues with high efficiency makes Hyst biomethane a second-generation and advanced biofuel which, in addition to qualifying for double counting, has a guaranteed market share in Italy thanks to the recent Ministerial Decree of 10 October 2014. This fact is all the more important since the current production of advanced biofuels is still too limited to think of being able to meet legal obligations without the aid of new technological solutions. Furthermore, Hyst biomethane is a hundred percent Italian biofuel, both at the agricultural and the industrial production stages (currently 95% of raw materials for biofuels in our country comes from abroad). Therefore, all the advantages of using Hyst would go to the national agricultural sector. Enea, who has long been following Hyst for its applications in the energy field, has also shown great interest in its possible uses in the food industry. In fact, BioHyst has been included as a technology partner for the production of new supplements from wild plants in a project presented, as part of Horizon 2020 (EU Research and Innovation Programme), by ENEA (Department UTAGRI), CNR and Italian and European universities. After the demonstration, the entrepreneurs present wished to make further appointments in order to evaluate the acquisition of Hyst systems to be used in ad hoc consortia to process local biomass. There was also an indication of interest in Hyst on the part of European and non European countries with great agricultural and energy potential. The energy sector will act as “fuel” for the BioHyst commitment to the cooperation project Bits of Future: Food for All. Diplomatic representatives of Angola, Benin, Burkina Faso, Ivory Coast and Nigeria were present at the meeting in order to follow developments, and they will be reporting to their governments with regard to the demonstration and possible applications in Africa to kick off as soon as possible the operational phase. The interest of these countries has increased also as a consequence of that shown by the African Union, who will undertake to make the project known to all its Member States so that they may join.